The motto of the Art Students League of New York is "Nulla Dies Sine Linea" which translates (loosely) as 'no days without drawing.' But the headline for today acknowledges that there have been many days without blogging. For which my brother and a friend or two occasionally give me a bit of grief. 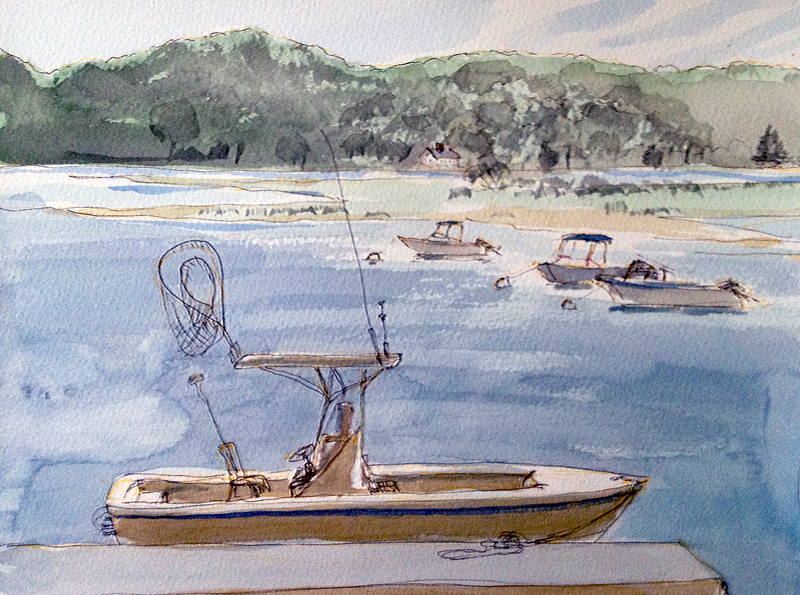 So by way of an offering toward catching up, here is a recent quick watercolor sketch done in one of my favorite spots just minutes from where we live, the waterfront in Cold Spring Harbor. A former colleague and former north shore Long Island resident Sheryl Kornman has exquisite taste in art, which is my snooty way of saying she wanted to buy this as soon as I posted it on Facebook. I was happy to accomodate. Here at my house we have an outplacement policy for the artwork. Thanks for providing a home for this one, Sheryl.